Guangzhou Minglan Trading Co., Ltd.
Q : What size of the silk scarf you have ? Q : What type of silk scarf you have ? Q : Can you print on my own design ? What's the special requirements of the artwork ? - Generally , we need your artwork with 300dpi in tiff format , or even any other format such as JPEG , PNG ,,,, etc , if your artwork has the resolution high enough . 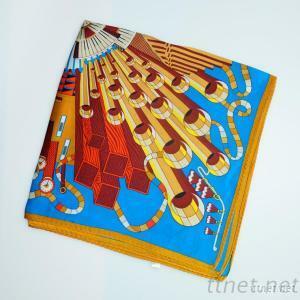 Q : Could I print the pattern on my own scarf ? A : It would be better if you could send us your own scarf . And we also can help you to purchase the fabric you want if you decide to make bulk orders and tell me the fabric supplier which provide you the fabric . Q : Before I make the bulk order , can I make a sample to check the quality of the digital printing ? A : Yes , Of course we can accept your sample order , I think all business are begin with small quantities . Any More, please contact us freely! !